As an occasional Pindi-wala and cricket junkie, I was overjoyed to see the schedule of Quaid-e-Azam Trophy’s first round matches, with as many as 3 FC games being played in the twin cities of Rawalpindi & Islamabad. Premier cricketing talent from the country was on display at the Pindi Stadium, KRL Cricket Ground and Diamond Club Islamabad. Players like Misbah ul Haq, Mohammad Hafeez, Umar Akmal, Umer Amin, Kamran Akmal, Adnan Akmal, Azhar Ali and Aizaz Cheema were to display their skills at the highest level on the relatively tricky pitches (from other cities). An equal battle between the bowl and bat makes for a riveting watch – if only. 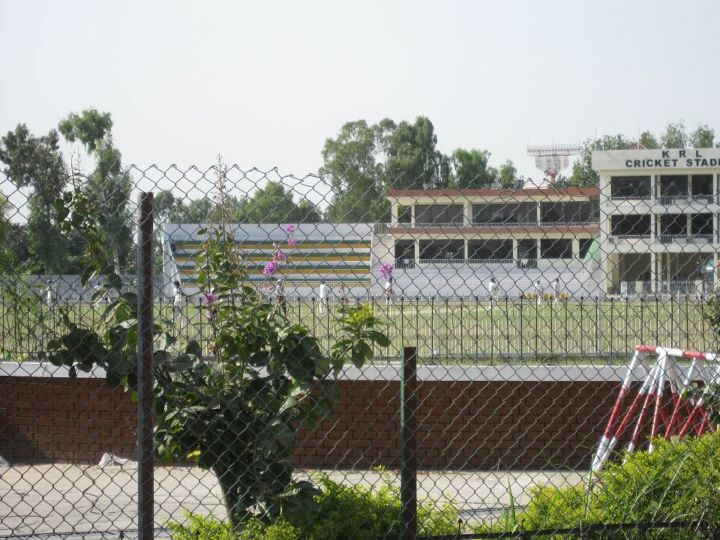 KRL cricket ground where Pakistan captain Misbah ul Haq, star all-rounder Hafeez and the Lahore Dynamite Umer Akmal were in action is only a 10 min ride from my base in the city. It was with great enthusiasm that I took out my CD-70 (today) and ventured towards my 2nd ill-fated attempt (first attempt was mild success) to watch a domestic match in 2 days. Where just a few years ago, a domestic match would attract a ground full of cricket enthusiasts, I was greeted with 3 check-posts manned by heavily armed guards and the 2 concrete stands of the ground empty. Not only was the ground inaccessible for fans who wished to watch their stars live, but the barbed wires put around 20 to 25 feet away from the ground fence also robbed the occasional passerby a glimpse of the action. As soon I saw the check posts, I immediately thought of returning but in the hope of convincing the plain-clothed security officer who manned the entrance I continued on, and after a couple of minutes of arguing (read: pleading) I realized that it was an effort in futility. The only answer, he was able to give me was, ‘order nai hai match dekhnay ka’. The petrol-wasool moment of the day was when i saw Umar Akmal play a typical arrogant pull shot for 4 at mid-wicket. Will soon post a picture of the ground that i managed to take despite the ‘no photography’ signboard in a hasaas-ilaaqa like KRL.